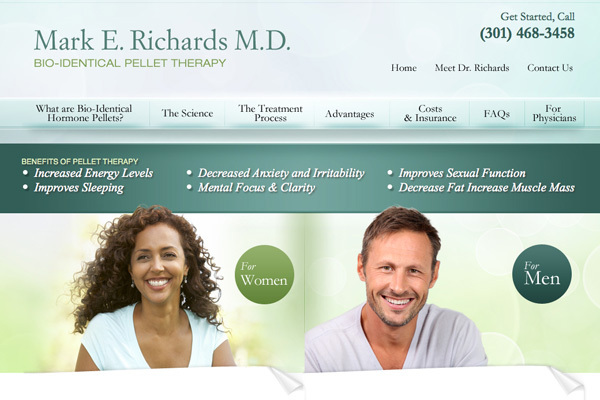 Dr. Mark Richards collaborated with Rosemont Media, a San Diego-based medical website design firm to create and customize a website outlining innovative hormone therapy treatment. Highlighted by interactive links and dynamic drop-down menus, the website allows Dr. Richards to provide his patients with a comprehensive educational experience. The addition of videos, patient testimonials and a link to the doctor’s radio interview gives patients the ability to gather in-depth information about the different types of procedures. As a highly recognized cosmetic plastic surgeon in Washington D.C., Dr. Richards expresses the importance of offering the highest quality patient care. The website allows his patients to establish a connection with his practice and hear about other patients’ experiences. Each page on the website is clearly outlined to answer common patient questions and explain why the bio-identical hormone therapy will help benefit their individual needs. The doctor also provides links to scientific articles about each procedure and links to the different treatment processes for men and women as well as treatment costs. Dr. Richards’ customized new website is fully optimized for search and social, and includes social media buttons to help him connect with patients online and strengthen the overall doctor-patient relationship.